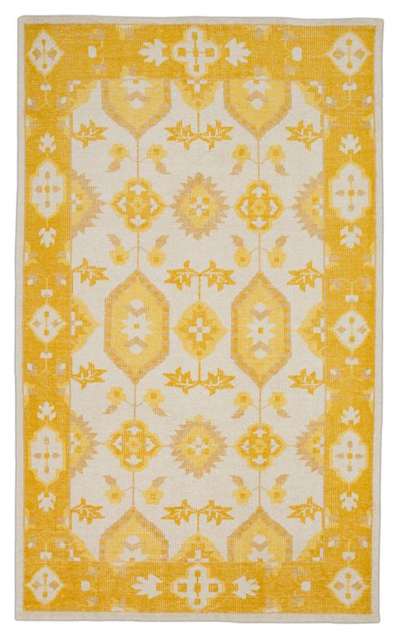 We love the indie-inspired design on this striking Sunflower Riven Rug, lovely for either a bedroom or open living space. $130-$407. Buy here. 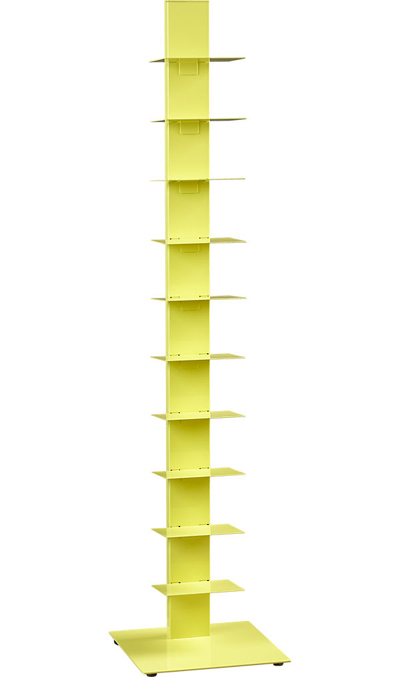 This Array Yellow Bookcase in lightweight laser-cut steel with bright yellow powdercoat adds a ray of light to a room. 14″ footprint is a find for tight spaces. 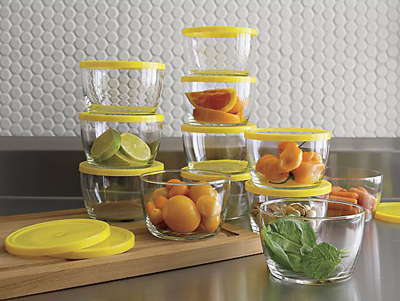 Each removable shelf can hold up to nine pounds. $189 Sale $160. Buy here. 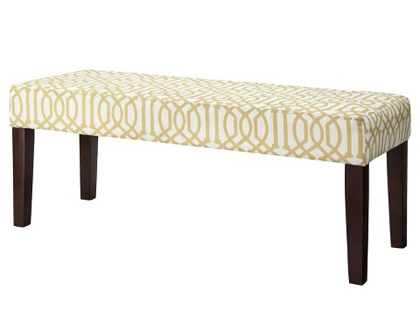 The modern and fun Threshold Trellis Bench in Yellow/White is a classic look for any living room, entryway or bedroom. $129.99 Clearance $64.98. Buy here. 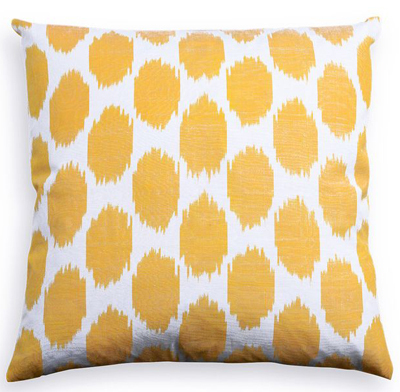 This Yellow Spotted Silk Pillow has an eye catching pattern in a vibrant hue that will liven up any room. It’s the perfect size to accent your favorite chair and will look equally chic layered against larger pillows to create a cozy look on your sofa. Down insert included $65. Buy here. 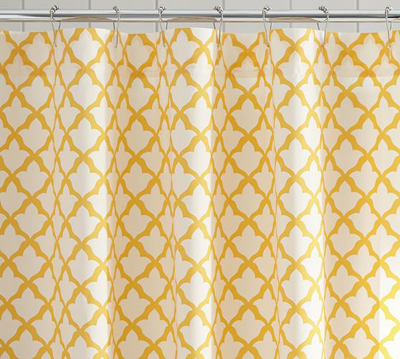 A Moroccan tile motif lets this Marlo Shower Curtain mix easily with both patterned and solid towels. $39.50. Free shipping. Buy here. 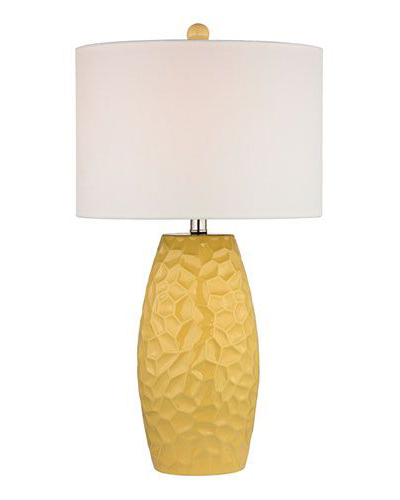 This Dimond Selsey Sunshine Yellow Table Lamp adds a cheery touch to any room. Includes white linen shade. $209 Sale $178. Free shipping. Buy here. 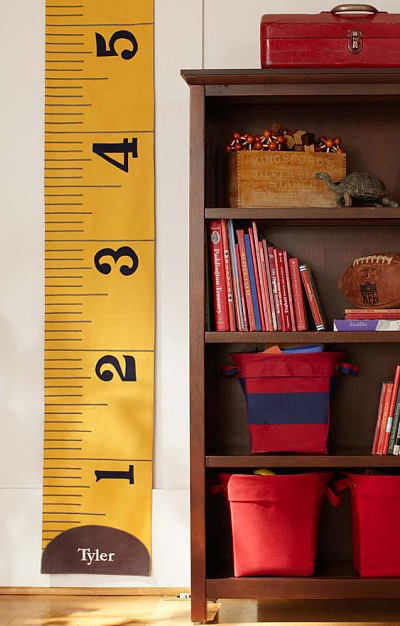 A full six feet high, this write-on Yellow Measuring Tape Growth Chart is big enough to track your children’s progress until they’re all grown up. 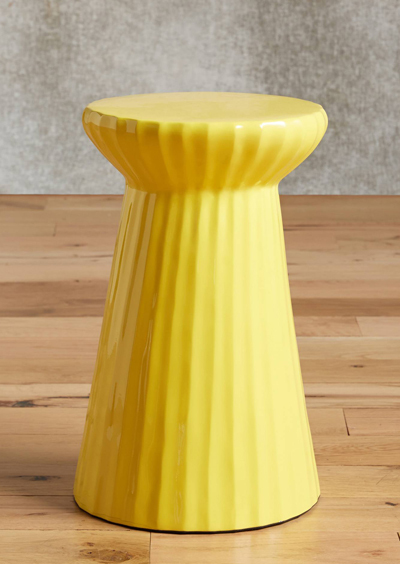 The familiar yellow-and-black graphics are bright and fun on the wall. $49 Sale $39. Buy here. 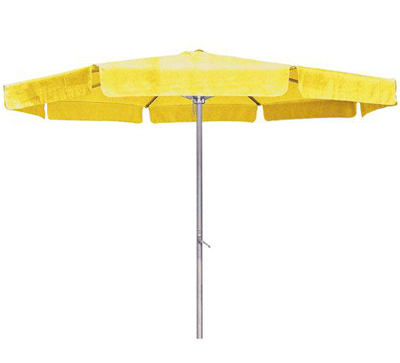 It’s always a sunny day with this Yellow Outdoor Aluminum Umbrella. Pole is made from aluminum with a hand crank. Can be used in a straight or tilted position. 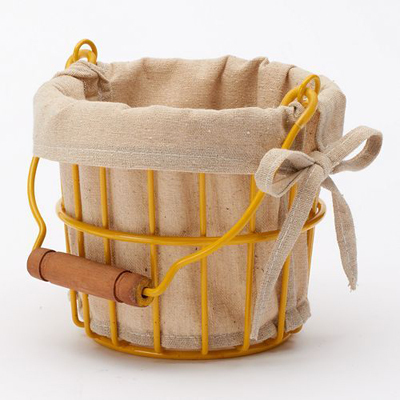 Comes in two pieces for easy storage. $80 Sale $68.95. Buy here. 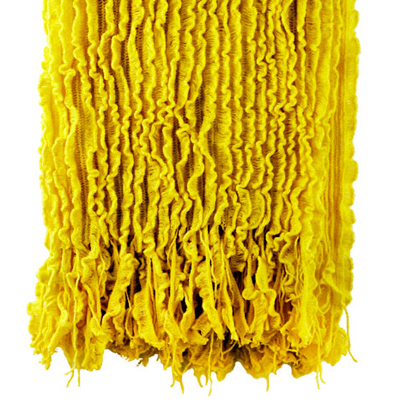 This fun Charlotte Yellow Ruffled Throw adds color and texture to any space. Measures 50″ x 70″ with fringe. 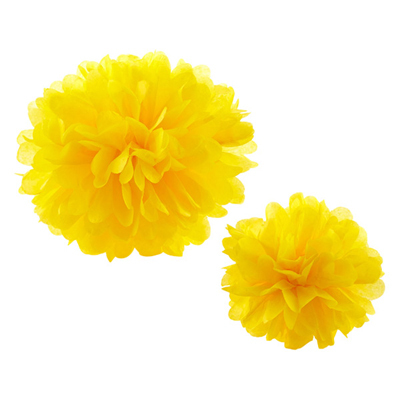 $67 Sale $45.01. Buy here. 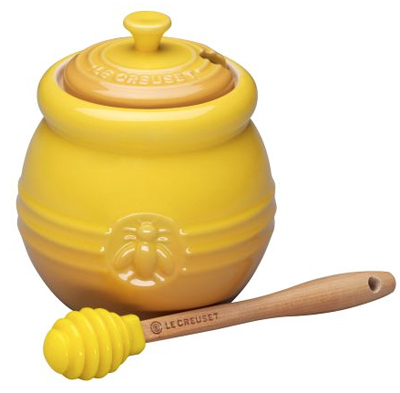 Made of the same virtually nonporous stoneware as the Le Creuset bakers, this Le Creuset Honey Pot with Dipper features a snug-fitting lid and iconic French bee design. 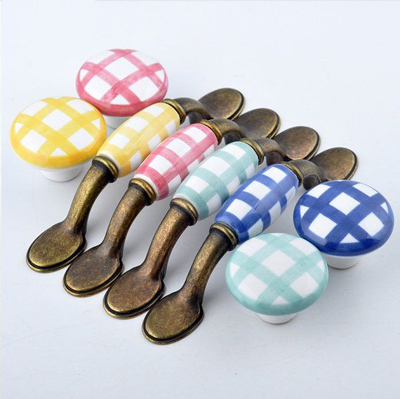 Includes dipper with easy-clean silicone head and hardwood handle. 16-oz. capacity. $29.95. Buy here. 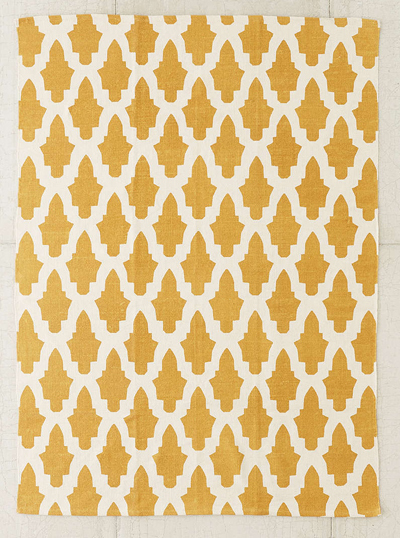 This Flourish Tile Printed Rug is a low-profile cotton rug printed with a stylish tile motif, from Magical Thinking. $44-$199. Buy here. This Jules Duvet Cover & Sham is a nod to the ogee arch (an architectural element that graces many Gothic doorways), freshened up with softer lines and a distinctive palette. $78-$288. Buy here. 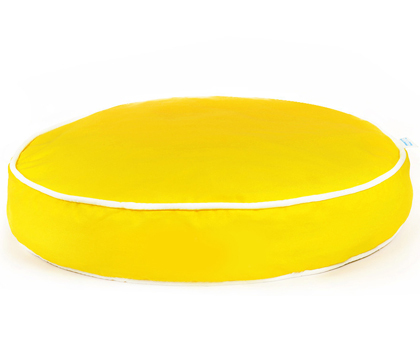 Let your dog snooze in style on this Benny Basic Circle Bed! This bed’s classic colors and comfy cotton fabric will keep your dog cozy all night. This bed features a chunky YKK zipper for security and easy zipping. 5″ x 41″. $188 Sale $56. Buy here. 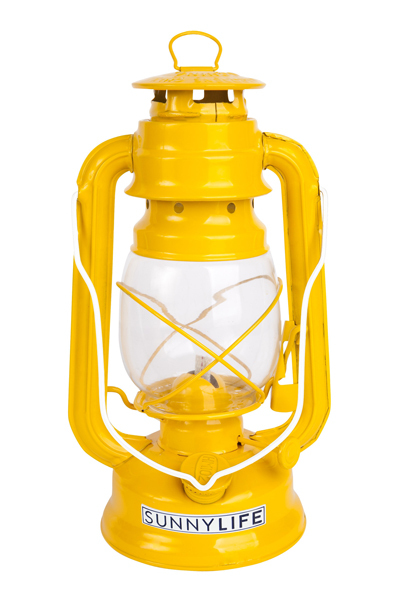 Bright, colorful and totally summer, this metal Hurricane Lantern in Vibrant Yellow will light up your hot and sticky evenings. $20. Buy here.